I've been trying to build a set of 40106 oscillators following the description in "Handmade Electronic Music". Six oscillators, one per inverter. It works, but the oscillators sound really harsh and noisy. The weird thing is, if I connect any of the outputs to ground, then suddenly the other five become nice (relatively) clean square waves. I've checked my power and ground connections, and I've got decoupling caps in place (100nF at the pins, 10uF at the battery). I haven't got any pull-downs because all six of the inputs are in use. In each case the resistor is a 220k in series with a 1M pot - the caps are 1nF, 2.2nF, 4.7nF, 10nF, 22nF and 47nF. Anyone got any ideas what I'm doing wrong here? Can you supply a schematic or a link to a schematic? As you probably already know, making the noise go away by grounding an output is a symptom. But without a schematic, it's only guessing to suggest what might be wrong. what are you connecting the outputs to ? it makes me think you might be overdriving something and shorting to ground drops the voltage. Attached a schematic. The six copies of the oscillator circuit all have different capacitors, but are otherwise identical. And how do you mix the oscillators? "If you sum more than three oscillators together with diodes you might notice that the signal gets oddly noisy;". I've tried a few approaches - through 100k resistors, through diodes, direct connection. I even built some basic transistor buffer circuits and ran each output through that. Same result. I even get the problem when only one output is connected to anything. Using 100 K resistors to mix won't do damage, but connecting outputs directly together is just as bad as grounding outputs. When one output is "high" and another is "low", they cause a connection from +V through two "on" transistors and then to ground. Pretty much shunting V+ to ground. Diodes are OK, but I'd put a resistor from the diodes' outputs to ground so that the diodes have what it takes to turn on. The best way is to use an opamp with feedback resistor and input resistors to form a virtual ground node. Google "opamp audio mixer" for details. Since there's no complete schematic, only a partial one, it's still difficult to see exactly what is going on. When building things, it's a good idea to draw out the full circuit before you start to build. There's no way to see what is really there without such a drawing. Your transistor buffer may work, but it really depends on exactly how that is hooked up - and we can't see any of that. But that doesn't solve the noise problem you currently experience. 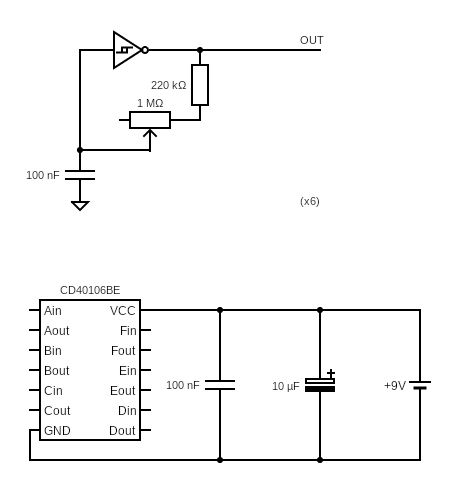 Note that grounding outputs or connecting outputs to outputs can damage the 40106, so I would at least suspect that your current 40106 has died or is partially bad. This sounds like there was/is a bad connection or wrong connection somewhere. I'll guess it's on a breadboard. I would rebuild the circuit (take it all apart and start over) using a new 40106. I would build one oscillator section first and see that it works properly. Then add another oscillator and test both. Keep doing that until it's finished. Very often rebuilding fixes such things. What supply voltage are you using? I had a strange experience with some square wave generation like this where the 40106s (HEF.... IIRC)I had at hand got burning hot at 15V. Never understood why but implementing a 7805 regulator for 5V operation and it performed immaculately. Gave me a preference to avoid 40106 for life though!